Bollywood superstar Rajesh Khanna's final journey has begun from his Aashirwad home in Bandra, Mumbai, in the presence of thousands of well-wishers and fans, who gathered to pay their last tributes to one of the biggest matinee idols of Hindi cinema. The last rites of Khanna, affectionately called Kaka by his near and dear ones and millions of fans, will be preformed at the Ville Parle crematorium in a short while from now. The hearse carrying Khanna's glass encased coffin was decorated with white flowers, as it made its way to the crematorium in rain. Fans have gathered in large numbers to have a last glimpse of their superstar despite the inclement weather. The route to the crematorium was lined with posters of Khanna, and some with his famous film dialogues and songs. Reports said that actor Akshay Kumar and Twinkle Khanna's son Aarav would light the funeral pyre. As news of the 69-year-old actor's death broke on Wednesday, many of his colleagues from the industry rushed to 'Aashirwad' to pay their last respects to Khanna. Khanna, who enjoyed unprecedented adulation from his fans across the country, was rushed to Lilavati Hospital twice in the past one month due to exhaustion and weakness. Khanna's health started deteriorating since April this year when he stopped taking food and complained of exhaustion and weakness. Khanna, who married actress Dimple Kapadia in 1973, has two daughters Twinkle and Rinki. Twinkle, an interior decorator and a former film actress, is married to actor Akshay Kumar. Khanna was born in Amritsar on December 29, 1942. Khanna lived in Thakurdwar near Girgaon in Mumbai. 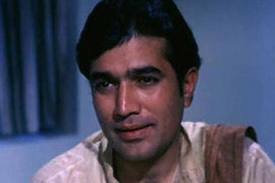 Rajesh Khanna was one of eight finalists in the 1965 All India Talent Contest organised by United Producers and Filmfare from more than ten thousand contestants. Subsequently, Khanna won the contest. He made his film debut in the 1966 film Aakhri Khat directed by Chetan Anand, followed by Raaz directed by Ravindra Dave both of which were a part of his predetermined prize for winning the All-India United Producers' Talent Competition.